Dance Divas 2018 premieres mere hours after Chicago’s iconic Pride Parade, making it the perfect event to add to an already celebratory weekend. The dancers who participate in this event donate their time and energy to create an unforgettable evening that includes giving audience members a chance to bid on a “Drag Makeover” where the winning bidder receives a full diva transformation to be debuted during the show. Better yet, Dance Divas 2018 premieres mere hours after Chicago’s Pride Parade, making it the perfect event to add to an already celebratory weekend. Kristi: Can you tell us about what audience members will experience at Dance Divas 2018? What makes this a must-see dance event? For Dance Divas the audience is treated to a show at Chicago’s legendary female impersonation lounge the Baton Show Lounge. There they see male dancers from the across the dance community transformed into legendary dancing ladies. Jeremy: Audience members attending Dance Divas get a truly unique experience. There is not another event or show quite like it in the dance calendar year and it is for a great cause. The money raised goes to The Dancers’ Fund for professionals within the dance community facing critical health issues. For Dance Divas the audience is treated to a show at Chicago’s legendary female impersonation lounge the Baton Show Lounge. There they see male dancers from the across the dance community transformed into legendary dancing ladies. As the tag line says, it is “high heels and high camp”. 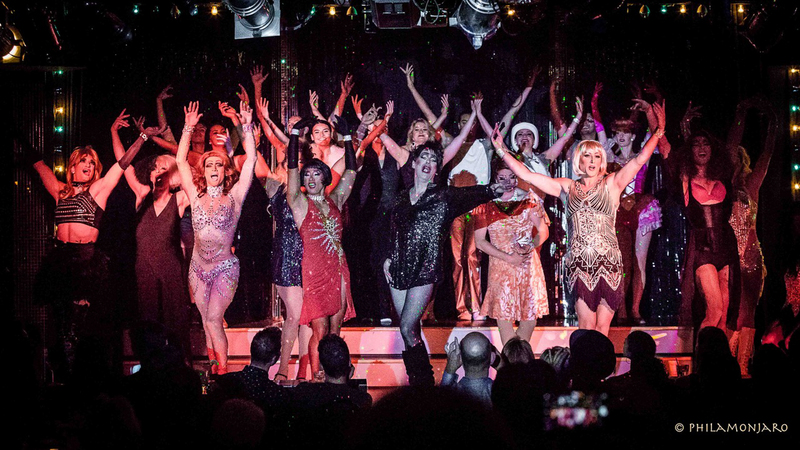 And they are supported onstage by dancers from all around Chicago, together for one night, in full on production numbers ranging from the likes of Liza Minnelli to Beyonce. There is a lot of glitz and glamour. Dance Divas was revived a year ago after a 10-year hiatus and this year’s show is all new and different than last year’s. This year, there are returning divas and some new divas as the show continues to reach out across our diverse dance community. The divas have officially been announced and represent dancers from, C5, Chicago Tap Theatre, DanceWorks Chicago, Giordano Dance Chicago, Hubbard Street Dance Chicago, Visceral Dance Chicago, and for the first time Ensemble Espanol! It will be a great show. Dance Divas was revived a year ago after a 10-year hiatus and this year’s show is all new and different than last year’s. Kristi: Speaking of that hiatus, can you tell us more about the history and return of Dance Divas? [Dance Divas] started out as an event for the dancers to come together and entertain their own, and celebrate each other and the dance legacy. It grew from there with everyone wanting to see and be a part of it. Harrison: The original Dance Divas was the brainchild of Chicago dancer and choreographer Tony Savino. He took the idea to Dance for Life founder Keith Elliott as en event to bring the dance community together before Dance for Life at the end of the summer. It started out as an event for the dancers to come together and entertain their own, and celebrate each other and the dance legacy. It grew from there with everyone wanting to see and be a part of it. All the make-up artists, costumers, and wig people volunteer to get the divas into full drag and regalia. This includes legendary performers in their own right like Monica Munro and Maya Douglas. Costumes were taken over by the divine Jordan Ross for Dance Divas’ return. Last years show was dedicated to Burt Pitcher who did the original for it’s run and passed away before the show’s return. Dance Divas started by honoring dance legends from a time that gave meaning to the words “dance diva” like Ann-Margaret, Ann Reinking, Donna McKechnie, Janet Jackson and more. It has evolved to include the new dance divas like Lady Gaga, Fergie and The Pussycat Dolls. Dance Divas features returning divas from the original Dance Divas like myself, Eddy Ocampo, and the director of the current Dance Divas Jeremy Plummer (who also choreographs the show along with McEldowney). Dance Divas started by honoring dance legends from a time that gave meaning to the words “dance diva” like Ann Margaret, Ann Reinking, Donna McKechnie, Janet Jackson and more. It has evolved to include the new dance divas like Lady Gaga, Fergie and The Pussycat Dolls. And the show still remembers its roots with a mix of old and new divas. There is something for everyone! The return of the show was prompted by the enthusiasm of Jennifer Edgecomb and Pam Crutchfield to bring it back for the 25th Anniversary year of Dance for Life. It played for two completely sold out shows last year ensuring a return to kick-off Dance for Life this year. Dance Divas 2018 premieres at Sunday, June 24 at 6 pm the famed Baton Show Lounge, 436 North Clark Street Chicago, IL 6o654. Additional performances are Monday, June 25 at 7pm and at 9pm. For more information, promotional video and ticketing, visit chicagodancersunited.org/dance-divas. Want to learn more about the images featured in this publication? Stay tuned for 4PHOTOS: Dance Divas 2018 with photo commentary by Jeremy Plummer and Harrison McEldowney.